Top: The edge of the droplet of silver nitrate on a dime. The lighter area is where the galvanic displacement occurred, and silver crystals have grown. Middle: Silver plates grow outward from the surface of a dime. Many of the edges of these plates terminate in smaller, sharp features that greatly enhance the Raman scattering signal. Bottom: Micro- and nanoscale silver crystals grow in a matter of minutes on the surface of a penny using a simple, single step reaction. These crystalline structures are capable of significantly enhancing the Raman scattering signal from molecules that adsorb to the surface of the crystals. The portability of the coins coupled with the simplicity of the reaction make the possibility of remote, field use of surface enhanced Raman scattering (SERS) a distinct possibility. New research from the Clark School showing how surface-enhanced Raman spectroscopy (SERS), a highly-sensitive technique used to detect the merest traces of targeted materials, can be made more affordable and more portable by replacing one of its components with a chemical reaction applied to pocket change, was highlighted in Chemical & Engineering News, the weekly news magazine of the American Chemical Society (ACS). The article covered a contributed talk given at the 241st National Meeting of the ACS by Fischell Department of Bioengineering graduate student Jordan Betz, titled "SERS on a dime: Galvanic displacement as a rapid, robust, and simple method for SERS substrate fabrication." Betz is advised by Department of Materials Science and Engineering/Institute for Systems Research professor and Maryland NanoCenter director Gary Rubloff. Raman spectroscopy is used to detect and identify substances which may only be present in minute quantities measured in molecules. When light from a laser floods a sample in a sensor, it scatters when it hits the molecules present. Since every kind of molecule scatters the light in its own unique way, scientists can tell what is present, and in what quantity, by analyzing the resulting spectrum. Surface-enhanced Raman scattering (SERS) takes the process a step further by placing the samples on specially-designed substrates (metal surfaces) capable of greatly intensifying the scattered light, allowing the detection of even tinier traces of a target substance. While this makes SERS a powerful sensor, its use has been limited by the difficulty of making the substrates, and the cost and short shelf-life of prefabricated ones. Designing an affordable, easy-to-use system for use in the field has been a challenge. 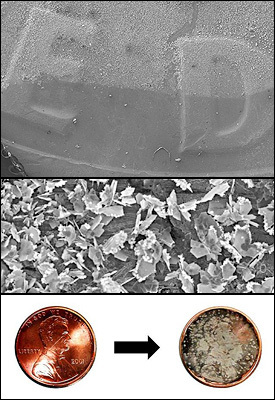 Betz and Rubloff think they've found one way around the problem by developing a technique that can use ordinary metal objects like coins as substrates. In his presentation, Betz described how ordinary coins interact with a solution of silver nitrate in a spontaneous electrochemical process called galvanic displacement. The silver ions in the solution diffuse into the surface of a coin, where they steal electrons from the atoms of copper or nickel. This causes the silver ions to lose their charge and become solid silver atoms, creating a starting point from which micro- and nanoscale crystal structures begin to blossom. The properties of the crystals can be controlled by changing the reaction conditions. The copper and nickel atoms, which convert to ions as they lose their electrons to the silver, diffuse outward into the solution. Betz, Rubloff and their colleagues found that when exposed to the Raman spectrometer's laser, the combination of silver crystals and the roughness of the coins' surfaces created a very high, localized electromagnetic field that intensified the scattering signal returned by a factor of 109, allowing them to detect lower amounts of a target molecule than they could with normal Raman spectroscopy alone. The coins even outperformed high-tech substrates made with state-of-art equipment in the lab. "Interestingly, the low-tech approach worked best," says Betz. "We hypothesized that the roughness and oxidation on the surface of circulated coins might create more sites at which the silver crystals could grow. To test this, we evaporated very thin films of smooth, unoxidized copper and nickel onto glass slides, then subjected them to the galvanic displacement reaction. In every case, the coins and their crystals were more effective at increasing the scattering." The process does not deface the currency. "The silver micro- and nanostructures that grow on the coins are so weakly attached you can use scotch tape, a tissue, or even water to remove them," Betz explains. "After cleaning up the coins, they don't look or behave any differently. The amount of copper or nickel displaced by the silver is miniscule. Kicking a coin down the street would probably have more of an effect on its mass and cosmetic appearance." The possibility of using substrates made on common metal objects, Betz says, will provide new opportunities to develop remote and portable SERS-based sensors that could be used to detect toxins, explosives, and contaminants in groundwater and food, as well as identify specific viruses and bacteria. "Over the past few years, there has been a strong drive to miniaturize instruments that once occupied an entire lab bench," says Betz. "For example, other researchers have shown that SERS can be performed using a laser pointer as the excitation source. Although hand-held Raman spectrometers are available on the market, we believe it's only a matter of time before someone develops a Raman spectrometer attachment for a smartphone. Using our method of substrate fabrication, you could have your spectrometer in one pocket, and your SERS substrate in the other."